We scrutinize a case of investment strategy, which aggressively bets nearly everything on a few or even on a single stock. Since inception it yielded 160% of return by maximum drawdown of -45.59%. The strategy is popular among retail investors on Wikifolio (distinguished as "Bestseller"). We critically analyze possible risks and rewards. First of all let us look at the performance chart. It may seem to be good and in a sense it is: although a trained eye captures a big drawdown in the beginning, the time to recovery was just about a month and normally the equity chart stays above the trend (red dotted line), which corresponds to the compounded growth of 0.25% per day. 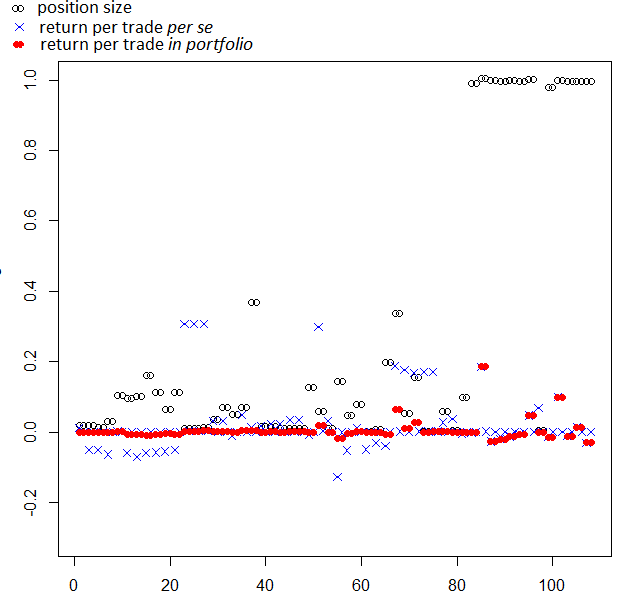 But let us look at at the chart of returns on positions. You readily see that the portfolio is not diversified. By some trades (upper-right corner) all capital is invested in just one stock! The portfolio manager (Carsten Hasenstab aka work4honor) does not make secret of his approach: he tries to buy a stock, which is (in his opinion) heavily underestimated. As his trade history shows, if he goes wrong (and often it is the case), he closes the position with a relatively small loss. A series of such small losses is not always harmless, you see a sequence of subzero blue crosses coincides in time with the period of the maximum drawdown! But when Mr. Hasenstab is right, he really makes Kasse! The problem is that sooner or later a black swan will come. And a single stock, in which Mr. Hasenstab invests, will severely drop overnight. In this case the approach to "cut losses quickly" will not work. 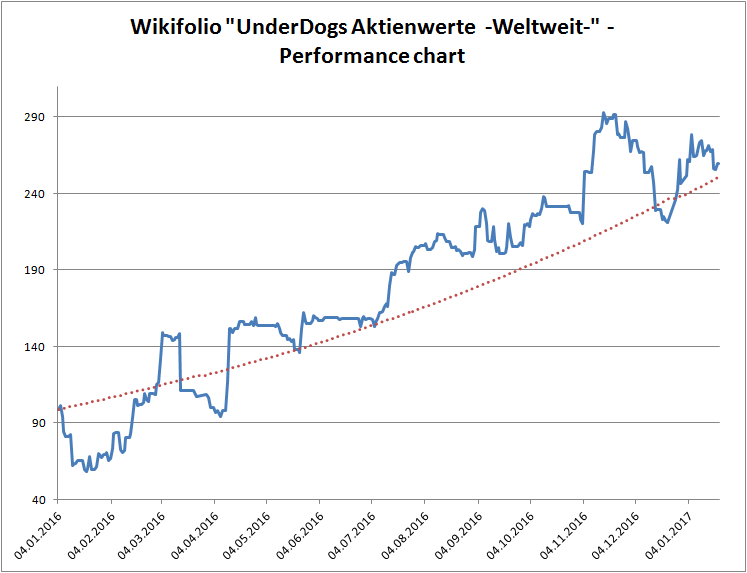 Notably, the investors does not recognize this risk: UnderDogs Aktienwerte -Weltweit- is marked as "Bestseller" and "Frequently bought" on wikifolio. But a disillusion and a disappointment may be hard! Is there a way to improve the strategy?! Oh, yes! First of all, a diversification among at least 5 assets would have helped. Of course it is not an insurance against a market crash but it is very unlikely that something like DieselGate will simultaneously happen with all stocks. Alternatively, a hedge with a (deeply out of the money) put option may also be helpful. Anyway, even if I, myself, find UnderDogs Aktienwerte too risky, it does not mean that it is bad. Contrary, I am quite impressed with Mr. Hasenstab's stock picking talent. That's why I am very interested how long it will survive and whether his stock picking ability does not deteriorate in future. If it doesn't, I make no secret that I, myself, will (in a sense) copy Mr. Hasenstab's trades. Of course I will never bet 100% of my capital on a single stock, but to bet a couple of percent is not a bad idea. Concretely: currently UnderDogs Aktienwerte consists mostly of Deutsche Bank (DE0005140008) and GoPro (US38268T1034). The former has already grown 80% from the historical minimum but the latter grew just about 15%. So inspired by Mr. Hasenstab, I will likely increase my GoPro position by one or two percent. Wouldnt it be a better improvement in terms of risk for this strategy to simply buy call options on the stocks which Mr Hasenstab has holding at the moment in his portfolio. The maximum loss incurred in this case would be known from the begininning and equal to the premium of the option. Probably not. First of all, the “genuine” options are unavailable in Wikifolio. 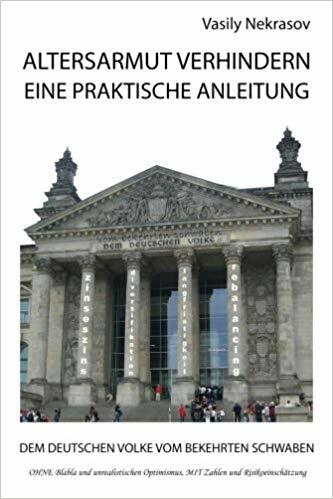 What one can buy is the so-called Optionsscheine, which are the certificates that replicate a payoff of respective option. However, a buyer should take the spread and the credit risk of the marketmaker bank. Secondly, the options on the stocks that Mr. Hasenstab buys would normally be very expensive in terms of the implied volatility. And last but not least, the theta is always against the option buyer. Dear Mr. I do not agree completely with you answer. In my reply, I was not considering the creation of a new wikifolio. I wanted to mention exclusively one way to make use of the data available from Mr. Hasenstab’s wikifolio. Call options on the stocks picked by Mr. Hasenstab are available on the exchange with different expiry period. If I understood correctly Mr. Hasenstab strategy is based on picking stocks which, according to his opinion, will in the short term future rapidly increase their value. Assuming that Mr. Hasenstab has a certain talent for picking stocks, I am not aware of any better strategy to make use of his knowledge while at the same time not being exposed to the risk of actually holding the stock he picks in your portfolio. 1. Yes, Mr. Hasenstab does have talent for stock picking but he also makes mistakes (who doesn’t?!). Options are complicated products and I would not recommend to trade them unless you really understand what you are doing. 2. Theta is the option parameter, which shows how it loses its [time] value with time, given that the underlying price (and its implied volatility) doesn’t change. Once again, options are complicated products and (contrary to stocks) often expire worthless. That’s why don’t be seduced with a “promising” payoff, a worthless expiry is usually much more probable.